Unexpected cold showers are a bummer. Most people forget about their water heater until it fails, and usually this happens at the worst possible time. Hopefully, a simple flip of the switch solves the problem, at least temporarily, but a tripped circuit breaker or reset button indicates an electric fault has occurred somewhere within the circuit. 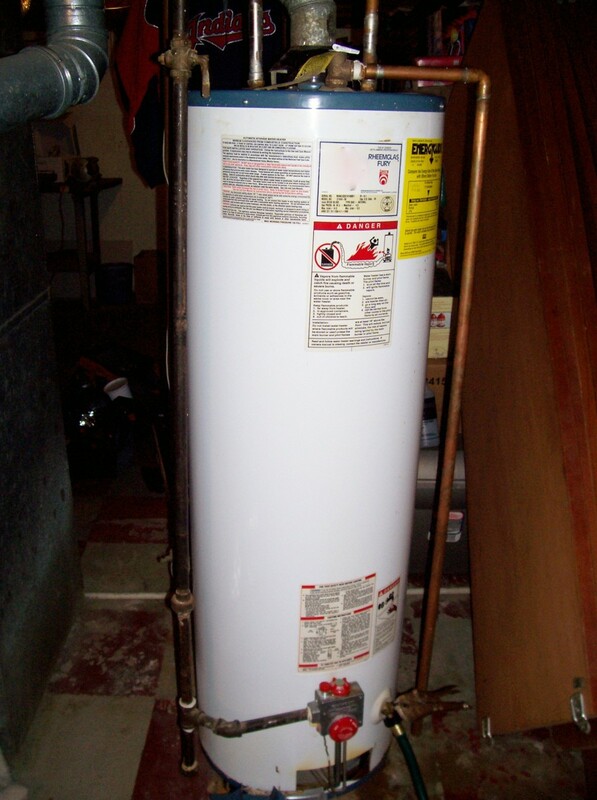 Sometimes, replacing a single inexpensive electrical part returns the water heater to working condition. Unfortunately, a leaking tank often indicates a complete failure. A competent technician always troubleshoots before installing any replacement parts. Learn more about how to diagnose and fix these problems below. 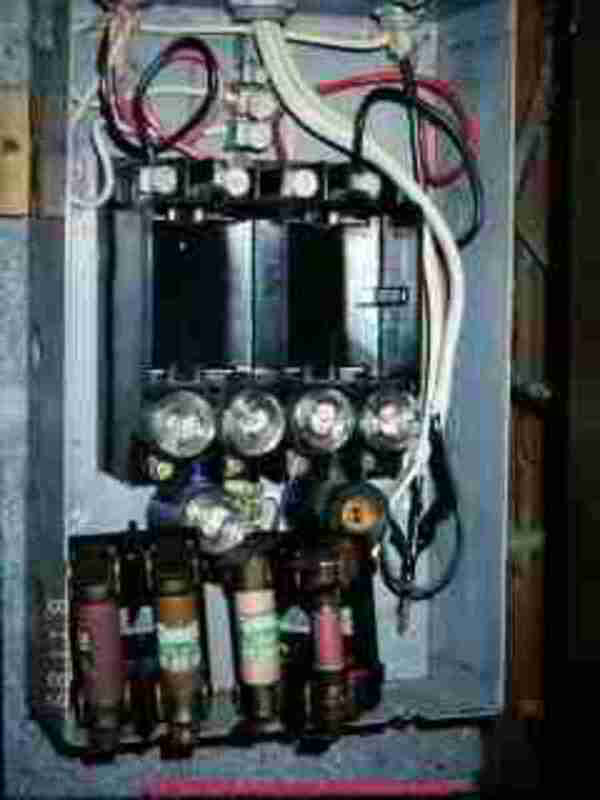 Always use a circuit breaker that exactly matches the service panel. Occasionally, an electric water heater's circuit breaker trips for no apparent reason and resetting its toggle solves the problem. Flip the circuit breaker's switch to the "Off" position and then back to the "On" position. This fully resets both legs of the circuit breaker. With the toggle set in the "On" position, a voltmeter should read about 240 volts across a two-pole circuit breaker's two terminals and 120 volts between a single-pole circuit breaker's terminal and ground. 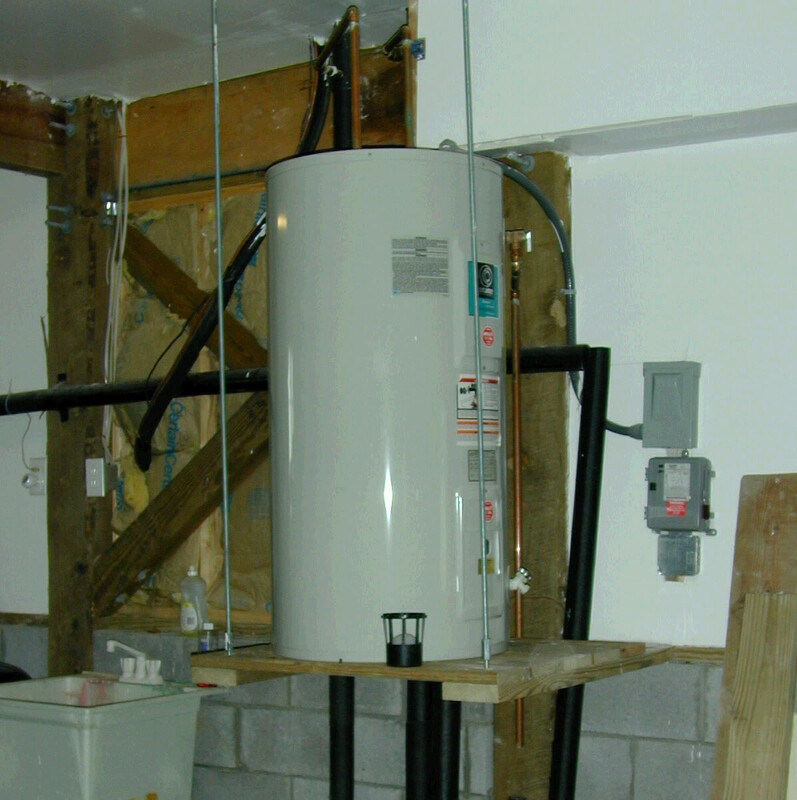 Let the system heat fully, then run a hot-water tap until the water heater turns on again. This type of issue indicates a serious fault somewhere in the system. If the circuit breaker trips immediately, the circuit has an electrical short to ground. Turn off the circuit breaker and keep it off throughout the repair process. Locate and correct the electrical fault before flipping the circuit breaker's toggle back to the "On" position. Often visual clues, such as black charred areas, make this the easiest water heater failure to troubleshoot. Open the water heater's electrical panels and look for worn wire insulation or a burnt wire terminal on one of the devices. A short-to-ground here proves the circuit breaker functioned as designed. If the circuit breaker looks or smells burnt, replace it immediately. Usually the circuit breaker burns near its wire terminal. 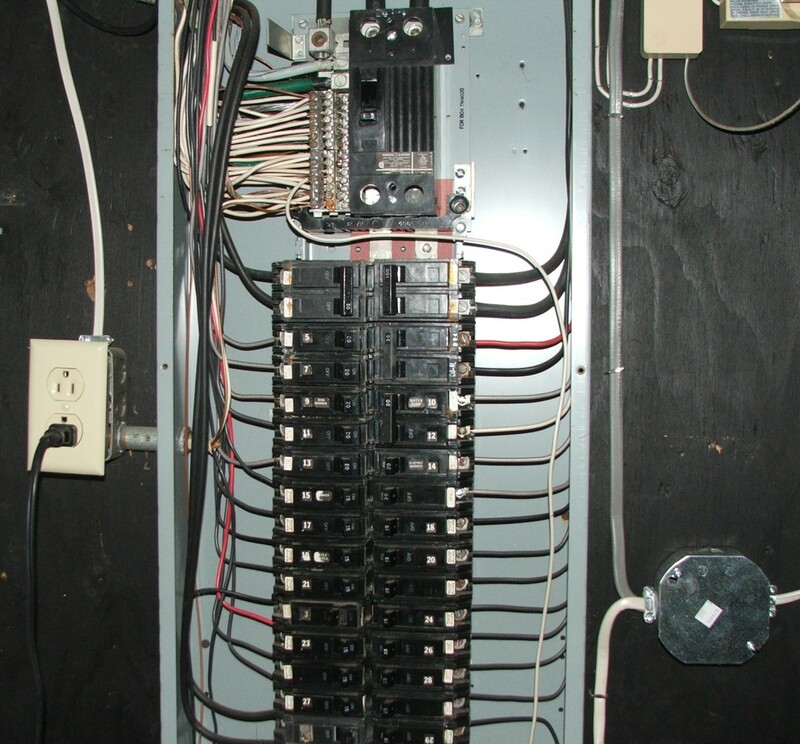 Turning on a heat-damaged circuit breaker can cause a fire in the electrical panel. If the circuit breaker has failed, replace it with an exact match. The circuit breaker's amperage rating, mounting style and terminal spacing must match the electrical service panel. Wiggle the circuit breaker's toggle switch back and forth. The switch should not move at all. A worn circuit breaker's contact points often fail to close completely. Electricity arcs as it jumps from one contact point to the other, creating heat and carbon buildup on the contact points. If the circuit breaker's toggle switch has excessive play, replace the circuit breaker. A water heater timer saves money when it turns off the electricity during non-demand hours. 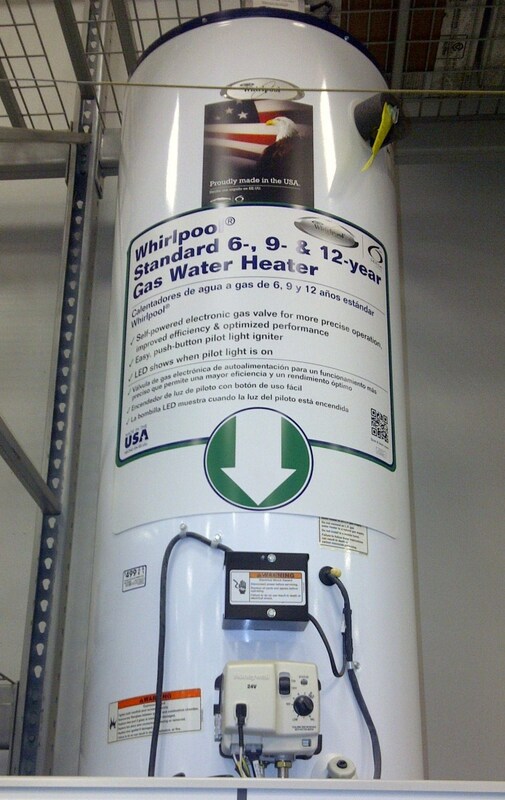 Without a timer, a water heater constantly maintains a set water temperature 24 hours a day. Most timers use a mechanical dial clock, but some are digital. 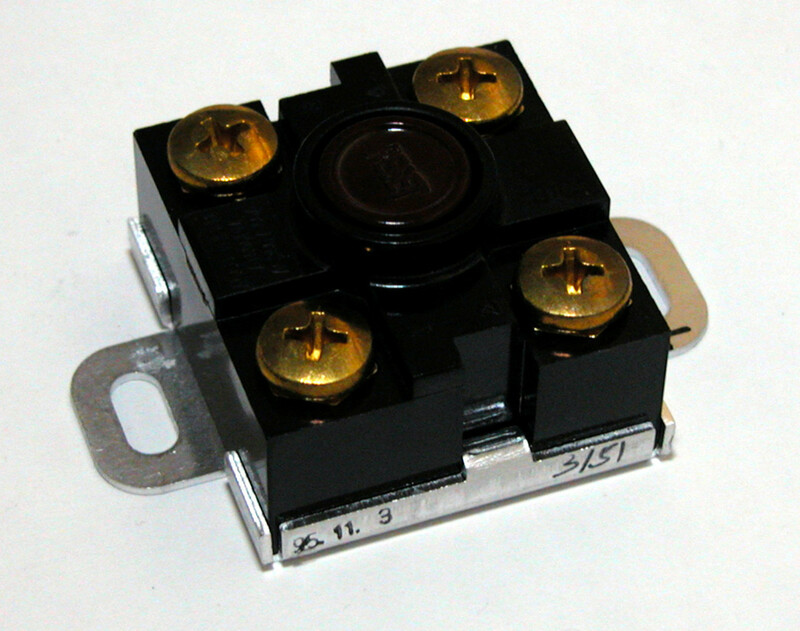 Both types have an override switch, often called a fireman's switch. A dial timer uses a set of pins, usually clamped to the edge of the dial, to cycle the timer's trip lever on and off. A properly adjusted timer can reduce electricity usage tremendously. Visual inspection: Check and reset the override switch. Verify the clock keeps time. If the timer's wire terminals look burnt, replace the timer with a compatible model. A label on the inside of the timer's cover state its model number and electrical ratings. Check the clock motor: If the clock motor has stopped spinning, check for voltage across the two terminals that the clock's leads attach to with a voltmeter. The meter should read approximately 120 volts. If not, troubleshoot the circuit breaker and the wire set between the water heater and the electric-service panel. If the meter reads 120 volts, replace the clock motor or timer. Time setting and trip lever pin adjustments: Readjusting the time setting, trip lever pin positions or the fireman's switch solves many water heater timer issues. To change the time setting on most dial timers, pull out the dial slightly and turn the dial until arrow in the center of the dial matches the appropriate time setting. Position an "On" trip lever pin on the dial approximately 45 minutes before the home's water usage begins for the day. This gives the water heater plenty of time to heat the water. Place the "Off" trip lever pin on the desired time setting; many homeowners turn off the water heater for the day shortly before bedtime. Adding a second set of pins, allowing short AM and PM run times, reduces electricity usage even further. Troubleshoot the water heater timer: Locate the water heater timer's "line" and "Load" terminals, using the timer's wiring diagram as a reference. Check the voltage across the timer's "Line" terminals, using a voltmeter. The voltage should match the voltage reading at the circuit breaker. If not, check the wire connections and wiring between the circuit breaker and the timer. Turn the fireman's switch to the "On" position. Check the voltage across the timer's "Load" terminals. The "Line" and "Load" voltage readings must match. If not, replace the timer. Reset the fireman's switch. This electric water heater's thermostat uses two sets of wire terminals. The thermostats act like the water heater's brain. Most electric water heaters use two thermostats, or two brains. The thermostats work independently of each other. Each thermostat controls a single element. A clip holds the thermostat against the tank's exterior surface. When the tank's surface drops below the thermostat's set temperature, the thermostat's contacts close. This allows voltage to pass on to the element. Once the tank reaches the desired temperature, the thermostat's contacts open. Checking the thermostat reset button: Many upper thermostats contain a red-colored reset button. The reset button acts as a thermal safety switch. It turns off the electricity if the tank passes a safe temperature. Occasionally a reset button will turn off for no apparent reason. Press the button with a finger and allow the tank to heat. If the reset button continually trips after the tank warms up to operating temperature, troubleshoot both thermostats looking for a locked-on thermostat. Visual inspection: Check the wire terminals, looking for carbon deposits or loose wires. If the thermostat looks burnt or discolored, replace the thermostat. If the wire terminals look loose, turn off the circuit breaker, then clean and tighten as needed. Troubleshoot the thermostat's operation: Turn on the circuit breaker. Test the thermostat for voltage. If using a voltmeter, turn it to the VAC setting. If the tank contains cold water, the thermostat's contacts should close and it will not show a voltage drop between terminals. Hot water should open the contacts and the meter will read the appropriate voltage. If using a continuity-style meter, turn off the circuit breaker and check for resistance through the contacts. 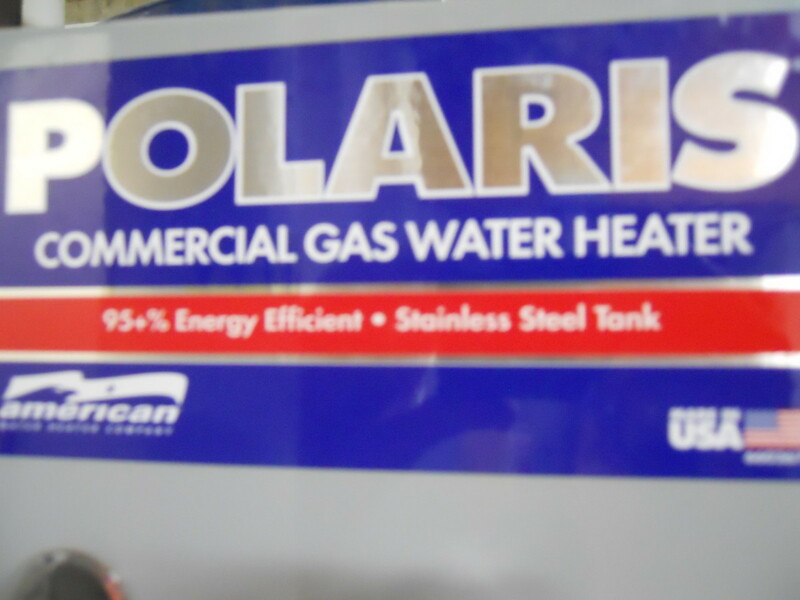 A cold tank should show minimal or no resistance, indicating continuity or a closed circuit. A hot tank should read infinity, indicating an open circuit. Replace a malfunctioning thermostat with a compatible part. Turn off the water heater's circuit breaker. Take note of the wire's placement on the old thermostat, using either a sketched diagram or a camera to take a picture. Pry the off thermostat from the clips holding it against the tank. Push the new thermostat into place. It will snap tightly against the tank's surface. Connect each wire to its respective terminal. This water heater element screws into the tank. The water heater's element screws into the tank and has two wire terminals. When the thermostat's contacts close, voltage passes through the element. The electrical current passing through the element creates the heat that warms the water. Most elements either fail at a wire terminal or inside the tank. A faulty wire terminal looks black or burnt and often has a loose wire connection. Troubleshoot the element for an internal fault with a meter. Checking the element for continuity: Turn off the water heater's circuit breaker. Loosen the heating element's wire terminals and remove both wires. Removing the wires isolates the element from the rest of the electrical circuit. If using a multimeter, turn the meter's function switch to the resistance or ohm setting. Place a meter lead on each element wire terminal and read the meter. A digital multimeter usually beeps when it detects continuity. If the meter reads infinity, replace the element. Using voltage to check the element: Turn on the water heater's circuit breaker. Verify the voltage at the thermostat. Check for voltage at the element's wire terminals. Turn a multimeter to its VAC setting. A water heater tester will usually light up. Checking the element for a short to ground: An element with a short to ground will trip the circuit breaker immediately. Turn off the circuit breaker and remove the wires from their respective terminals. Turn a multimeter to its resistance setting. Place one lead on a bare metal section of the tank. Hold the other lead against one terminal. The meter should read infinity. If not, replace the element. Prior to replacing the element, check the water heater elements' wattage rating, found printed on the water heater's identification tag. The identification tag states the element's upper and lower wattage limits. An element matching the upper limit heats the tank's water quicker than one matching the lower limit; it also uses more power. Before replacing an element, turn off the water heater's circuit breaker. Attach a hose to the tank's boiler valve, the hose fitting near the tank's base. Run the other end of the hose to a floor drain or outside. Turn off the tank's water supply valve. Open the boiler drain. It is possible to change elements without draining the tank, however, this method does leak some water and requires quick and decisive work. Remove the wires from the respective terminals. Remove the old element with an element wrench. Install a new element. Close the boiler drain. Open the water supply valve and fill the tank completely before turning on the circuit breaker. The pressure relief valve rarely fails. Hot water spurting from the pressure relief valve usually indicates that a thermostat is locked in the "On" position. This causes the water to overheat, which builds up excess pressure inside the tank. A heavy spring, located inside the valve assembly, holds the valve shut. Once the tank's water pressure overpowers the spring, the valve opens. The spring will close the valve after the pressure drops. A functioning pressure relief valve prevents water pressure from reaching dangerous levels. 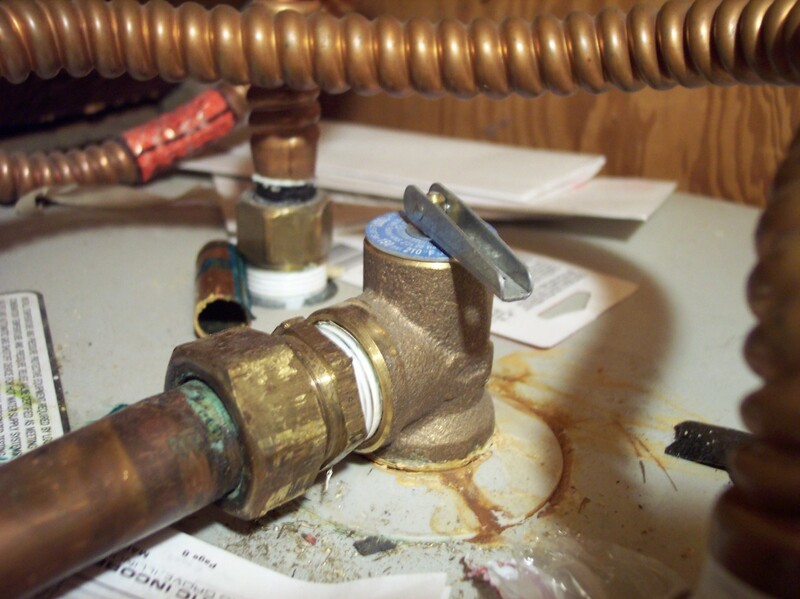 Before replacing a pressure relief valve, test the thermostats. Replacing the valve will not solve a thermostat issue. If the thermostats pass inspection and the pressure relief valve seeps water, open and close the valve manually. Its possible for debris to lodge in the valve. If water continues to seep, install a pressure relief tank. Water overflowing the drip pan or pooling on the floor around the water heater is never a good sign. It often indicates that an older unit has reached the end of its lifespan. What starts out as a small crack will eventually end up as a complete rupture. This can cause significant damage to the surrounding area. Visually inspect the water pipes and connections near the water heater. If dry, open the panels covering the thermostat and elements. Check for leakage around the elements. An electrical short can burn a hole through the element, causing the leak. 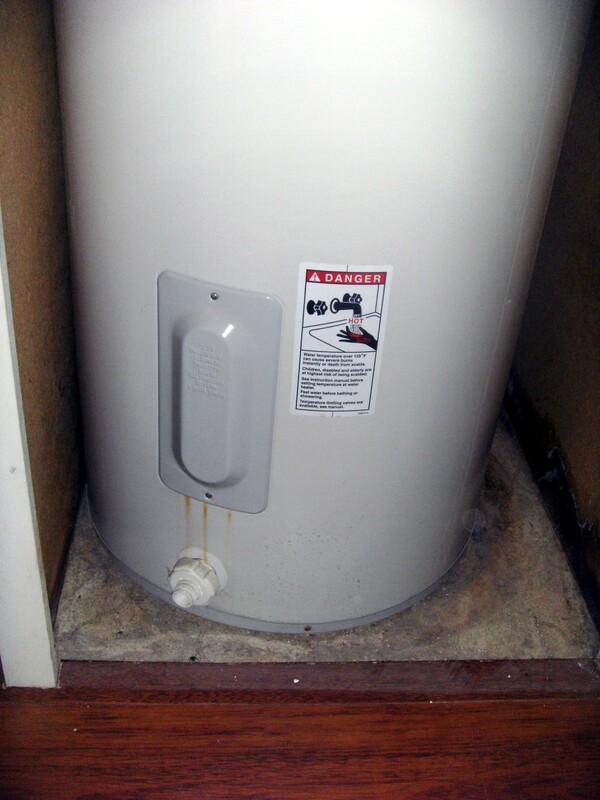 If the water heater's tank leaks, replace it with a physically similar sized tank. The whip, a flexible conduit and wire set, connects the water heater to the home's electrical circuit. During the home's construction phase, the electrician cuts the whip to fit the original water heater. Changing tank heights can alter the whip length. Many DIY homeowners with previous electrical and plumbing experience can replace or repair their own water heater safely with no problems. Always follow all safety precautions and use common sense. If you have any doubts, call a professional. 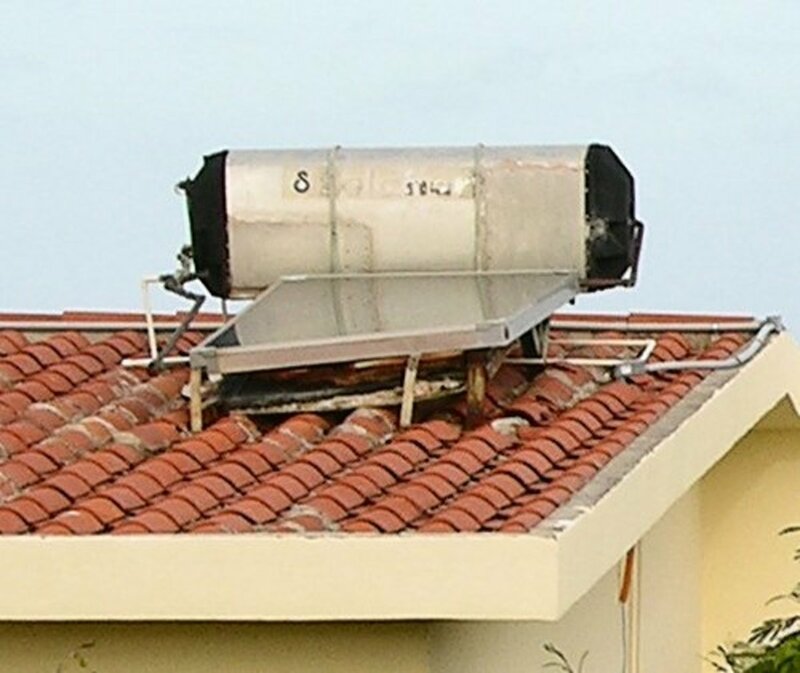 Before repairing or replacing the water heater, verify that your homeowner's insurance company and the local municipality does not require a permit and/or a licensed contractor. In the case of a water heater-caused fire, this documentation helps protect the homeowner and possibly puts the blame on the installer. Why is there no power to the circuit breaker? If you have power throughout the rest of the house, then you should have power feeding the circuit breaker. If you have power feeding the circuit breaker but none leaving it, then you likely have a faulty circuit breaker. The breaker tripped for our water heater. Should I call a plumber to inspect it? I would reset the circuit breaker and see what happens with your water heater! If it trips immediately or repeatedly, then you need to decide if you are knowledgeable enough to troubleshoot the issue without professional help. If you have any doubts about your ability when working with any electrical appliance, then you should call a technician. I accidentally touched the two hot wires together on the bottom heating element while the power was on. Now nothing works on the water heater. Do you have any advice? That should have tripped the circuit breaker instantly. The real question should be, why would you play around with loose live wires? Always turn off the circuit breaker when working with loose wires. DIY Plumbing: No Hot Water! Great hub with great advice -- thnks for this really helpful article.